- how an RC glider can top 500mph! Dynamic Soaring, often abbreviated to DS, broke in to the rc gliding scene in the late 1990s and is an adrenalin-packed experience for anyone looking for a rush that conventional slope soaring can't always provide. The fundamental thrill of DS is speed. If you thought that rc jets were fast, take a look at some experienced radio control glider pilots performing Dynamic Soaring and you'll be somewhat impressed, and very surprised. In fact, about the only limitation of DS is the strength of the glider's airframe, as well as the pilot's nerves; the speed and forces that act on the glider during a good DS flight can be phenomenal - many wings have folded and airframes have failed as a result of 'over-DSing'! 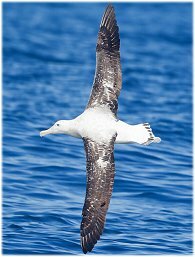 Believe it or not the world's largest seabird, the Wandering Albatross (shown right, img.©J.J.Harrison), is way ahead of us rc pilots. They sussed out Dynamic Soaring long before we did and it's how they soar over thousands of square miles of open ocean while using very little energy indeed. Barely a wing flap is needed to cover such huge distances, as the birds take advantage of different wind speed zones at differing heights about the sea surface. In a nutshell, energy can be drawn from differing zones of wind speed. The principle involves some basic laws of physics, kinetic energy and a few more subjects that you probably didn't pay attention to at school. Conventional slope soaring with an rc glider makes use of air that is being forced upwards as it approaches an area of higher ground i.e. a hillside or cliff face. The upward push of air ('ridge lift') keeps the glider aloft and the pilot needs to keep the glider flying around the top face of the slope to get maximum lift. Ideally DS is done on the leeward side of a ridge, although a normal hillside that is experiencing the wind blowing off the top is just about acceptable (but launching isn't as easy, and perhaps a bungee or winch launch on top of the hill might be necessary). 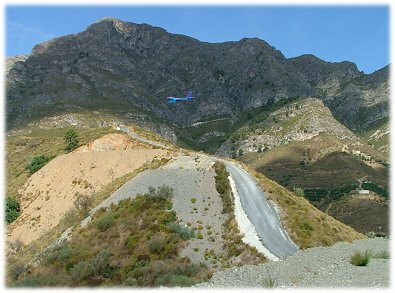 But for Dynamic Soaring from a ridge, as in the picture above, the glider is launched into the ridge lift (area 'A') as if conventional slope soaring and then it is flown round to the leeward side. The wind blowing off the top of the ridge continues in an approximate straight line away from the ridge (area 'B') and the area below the ridge top (area 'C') is sheltered and so the air is relatively still, or very slow moving. The difference between the two areas of fast moving air and still air creates a definite boundary layer and finding this layer is crucial to successful Dynamic Soaring. Once flown round to the leeward side of the ridge, the glider picks up speed because it now has a tailwind. Flying the glider downward towards the still air below the boundary layer accelerates it further because now gravity is kicking in, increasing its air and ground speed (imagine freewheeling on your bike, down a hill with a tail wind helping you along...you move fast!). When the glider crosses the boundary, there is very little drag from the still air to slow it down (no head wind to speak of). The glider is then pulled out of the dive and flown back up the slope, back across the boundary layer and in to the wind blowing off the top of the ridge - not directly in to it, but more 'side-on' to keep the resistance minimal. Now the glider experiences an increase in lift and energy as the wind increases the airflow over the wings. The pilot then makes a quick turn to fly the glider downwind again, and repeats the same circuit. The turn downwind needs to be made quickly so that the glider doesn't lose any airspeed as a result of being flown in to the wind. Every time this circular flight path is repeated the glider picks up more speed - a small amount each time. So, the more the glider is flown in this way, the faster it will get until either something snaps or the pilot can't cope any longer! Probably the hardest part is finding a suitable slope that generates the perfect DS conditions. A ridge is the best option and preferably one with a nice 'bowl' on its leeward side. The photo below shows an effective DS site local to where I used to live (that's my glider in the pic). It's far from ideal but the sharp ridge that the road follows provides an excellent cut-off point for a boundary layer to form. The first time I tried my hand at Dynamic Soaring it scared the jeebees out of me! My little glider did stand up to it, but wasn't a very suitable airframe - enough to show me what DS is all about though! Don't be fooled, DS is fast! You need to have the right kind of glider and the right frame of mind. Your reactions have to be pretty good, and you need to be able to keep hold of the transmitter when your hands start shaking! But it's a lot of fun, and addictive too if you find the right combination of glider and slope. If you have access to a RealFlight rc flight simulator you can try some virtual Dynamic Soaring on there... load the Sierra Nevada DS Ridgeline and the Shuriken 60" Sloper for some high speed action! Now that's fast - more than Mach 0.5! With an rc glider!! Despite the impression that that video gives, you don't need a mega-expensive composite racing glider to enjoy some Dynamic Soaring. A lot of different gliders can be flown in this way, but obviously each will have its own limitations. The basic principles of how and why DS works remain the same, regardless of glider type and size, and the height and size of the ridge you're flying from. If you can't find a suitable DS hill, you can get a small taster of the dynamic soaring effect by flying consecutive loops whilst slope soaring normally - so long as your glider's airframe is up to it, and the wind strength is right (i.e. say 20mph+). Simply gain some height and dive down in to wind and perform a loop. Not too tight, keep it reasonably large. Go straight in to another loop and just keep doing them, all the time taking care to keep the glider in front of the slope, and maintain a constant altitude. With each consecutive loop, the glider will pick up a bit of speed from 1) having a tail wind as it goes over the top of the loop and 2) the dive on the back side of the loop. If the conditions are right then the glider will gain a little more speed on each loop than it loses during the climb in to the next loop. As a result, the speed increases throughout each loop. OK, so this little game might not share exactly the same rules as true rc dynamic soaring, but the end result is the same. I love doing this with my Graupner Swift, a favourite glider of mine. So there you are - if you've got any kind of ridge-type slope close to home, why not try your hand at rc dynamic soaring, or at least the pseudo DS'ing of consecutive looping. Careful though - you might just get addicted!